We are very happy to announce that the next brewery we’re bringing to Colorado Springs for our ongoing Meet the Brewer series will be Grimm Brothers, from Loveland. Grimm Brothers is unique in that they specialize in traditional style German ales and lagers, but with a subtle twist that makes them feel quite Grimm. The brewhouse is known for their popular Snow Drop Köttbusser, which was a nearly extinct beer style utilizing oats, honey, and molasses. The style historically predates the German beer purity laws when those ingredients became unlawful to use. Their Little Red Cap Altbier has one multiple medals at the Great American Beer Festival, including gold. In addition to these two, we’ll get to try a few specialty beers as well, including an Oktoberfest style beer just in time for Oktoberfest! 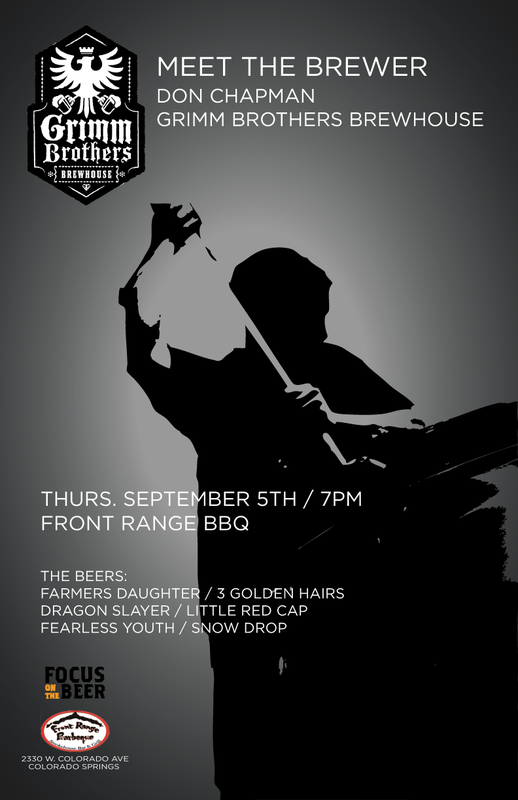 Don Chapman, head brewer and company president, will join us on September 5th to hang out, showcase a few of Grimm’s mainline beers, a few specialty beers, and to tell us all about the Grimm Brothers Brewhouse. It’s going to be a fantastic night, and we’ve really been looking forward to announcing this particular Meet the Brewer. See you there! Farmer’s Daughter – A Marzen style beer for Oktoberfest. The beer pours an amber color and has a substantial malt body, this beer leaves a refreshing crisp finish making it perfect for welcoming the harvest. 6.2% ABV. 3 Golden Hairs – A clean, hoppy pilsner from one of Grimm’s specialty lines. Brewed in the Czech style, featuring a malty pilsner aroma and flavor, it is balanced with the floral hoppy character of Saaz hops and is quite refreshing. 4.6% ABV. Dragon Slayer – A Bamberg style Rauchbier. Historically the malts in these beers are smoked with beechwood, providing a wide range of smoky flavors and aromas. This one is a specialty offering from Grimm Brothers and should be a real treat. 5.5% ABV. Little Red Cap – An Altbier with multiple GABF medals, one gold and one bronze. On the sweeter side of things, but balanced nicely with European and American hops. 5.2% ABV. Fearless Youth – This full bodied Munich Dunkel is made with a touch of hoppiness and has a bready and chocolatey flavor from toasted malt. It’s then lagered for a clean, crisp finish. 5.2% ABV. Snow Drop – The Köttbusser style was outlawed in Germany because it contained oats, honey, and molasses. The style became lost over the centuries but Grimm has resurrected this refreshing ale and added a kiss of hops. 7.1% ABV.